Yesterday the Herald reported that the NZTA are looking at adding tolls to four roads currently under construction or in planning. The New Zealand Transport Agency is eyeing up tolls on four uncompleted roads which it says could support their successful opening and smooth the way for user-pays road pricing, documents released under the Official Information Act show. Transmission Gully, the Tauranga North Link, Puhoi to Warkworth, and Petone to Grenada meet the criteria for tolling, such as making sure the fee doesn’t deter motorists from using the road, that there’s an alternative route, and that it’s in line with the government’s objectives, a paper to NZTA’s investment and operations board committee in March shows. I suspect many in the media and general public would claim that this is just revenue gathering. So, it’s worth pointing out that $28 million would only just scratch the surface of what these projects cost to build. Even on our most used toll road, Orewa to Puhoi, the toll only covers a small fraction of what it cost to build and was imposed to allow it to be built sooner. What is more concerning to me is what impact the tolling might have on traffic volumes and how we justify projects. The report shows the Tauranga Northern Link has the best benefit-cost ratio at 3.1 untolled, dropping to 1.3 with a toll, followed by Transmission Gully at 1.6 untolled and 1.1 tolled. The Petone to Grenada route, which has subsequently been sent back to review after falling short in the project evaluation, had an untolled ratio of 1.5 and Puhoi to Warkworth 1.03. The latter two roads did not have tolled ratios confirmed at the time of the report. These outcomes really raise questions about how we evaluate transport. Travel time savings are usually the biggest contributor to the benefits used to justify these projects. If tolling is going to turn so many people away from using a project then perhaps we need to rethink just how valuable people actually consider their time is. Particularly in cases like Puhoi to Warkworth where the business case has been massaged as hard as possible just to get it to scrape over 1. This is also likely an issue with having a requirement for a free alternative. Before spending potentially billions on some of these mega-projects, perhaps we should first consider tolling the existing routes they’re to duplicate to get a more accurate representation of what the level of demand actually is. Or perhaps, in the case of Transmission Gully at least, the rail line should be considered as the alternative. Of course, travel time savings are used to justify many PT projects too. It would be interesting to see just how many projects (of all types) that would be built if those travel time savings were calculated differently. Perhaps this another indication that we need more wide ranging reform into how we assess projects. Especially this is intricately linked to often widely inaccurate modelling to begin with. Also concerning are the comments that they’re only just considering tolling now. Officials warned the board that because Transmission Gully and Puhoi to Warkworth, which are both public-private partnerships, were under construction, further work that had to be done put the opportunity to impose the charge at risk by push up against the completion dates. Transmission Gully and Puhoi to Warkworth were named as priorities by the former National government nine years ago. A decision on whether to toll or not should have been made clear at least as far back as the consenting phase. With coincidental timing, Stuff yesterday revealed that the Petone to Grenada (P2G) is even worse that initially suggested. 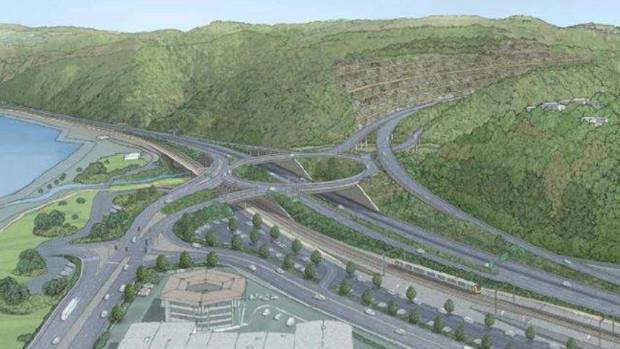 A withering appraisal of the proposed Petone-Grenada highway north of Wellington says it would have a significant environmental impact, could fail horribly in an earthquake, and its $270 million price tag could be closer to $1 billion. An independent team of experts helped the New Zealand Transport Agency write a report that took a red pen to its work to date, which stretches back to 1995 and has already cost $18m in planning and property purchases. But Emma Speight, the agency’s regional relationships director, said the report did the job requested – sending the project back to the drawing board with $18m already spent and before a single hillside had been carved up. The Petone-Grenada highway was intended to be a four-lane expressway between the northern Wellington suburb of Grenada North, and Petone in Lower Hutt, carving through rugged terrain known as the Horokiwi Crest. But the “Petone to Grenada Project Evaluation”, commissioned by the transport agency in mid-2017, effectively puts the favoured design on hold. 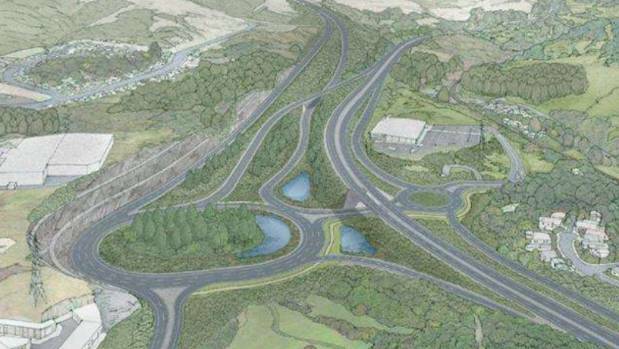 The concept of a road linking Petone and Grenada is still on the table, but the report suggests dialling back the “expressway standard” and having a speed limit closer to 60kmh so it can curve through the hills rather than cut into them. This is because, if the eight-kilometre highway was built to NZTA’s proposed design, it would cost $125m a kilometre. That would give it a $1b construction cost, making it more than four times the relative price of the 27.5km Transmission Gully motorway, which is costing $28m a kilometre, the report said. The Petone-Grenada highway would also have three massive cuts into the terrain. One would take out the face of an entire hillside above Petone to create a drop of up to 85m – the same size as a face at the nearby Horokiwi quarry. These cuts into fault-fractured rock could fail in a significant earthquake, blocking the road with a landslide. It could be three to seven weeks before vehicles could access it again, which is only marginally better than what is expected of the existing State Highways 2 and 58 after a big quake. Investigations into the Petone-Grenada highway discovered a previously unknown splinter faultline in the vicinity of the proposed Petone interchange. This looks very much like building a massive project for the sake of building a massive project, the worst justification for building something. I wonder what the BCR is on the project now? Excellent article thanks. What exciting times. I’ll never support taxpayers’ money being used to build a hugely costly, environmentally damaging road and then reserving it just for the people to whom the toll is insignificant. I returned from beautiful Opononi on Monday. As we approached the Puhoi-Orewa toll road I mused on how the time spent paying the toll online compared to the time saved by not taking the old route…I then dismissed the thought and concentrated on getting home safely. I have a credit card set up on auto-pay. It takes me precisely 0 seconds to pay. I imagine that the vast majority of trips would be paid in this way. If you use this road once every few years as was the case for me, why would I set up an autopay? Neither of us have any idea but I’m guessing most people pay per journey online. Most people probably pay per time. Most trips are probably paid for by autopay. There are approximately 19,000 trips on the road each day. Anyone going more than monthly would almost certainly be using autopay or bulk buying in advance. You’d have to imagine that the vast majority of trips are by regular users. Yabbut I am not a regular user; I’m special…and I like musing…and one of the things I was musing on was how long it would be before someone pointed out that “the vast majority of trips…..”, thus confirming that I am special. It’s really convenient that Greater Auckland posted a timely article about toll roads raising questions, the pertinent one for me being “have I paid that toll?”. Thanks Greater Auckland! The more toll roads there are, the more it’s worth everyone having a toll account with NZTA. I tend to pay the toll during down time, often when I am using my computer for something else. Once I’m on the road I find the eight minutes less driving much more valuable than the time I used paying the toll. Also on a few occasions when we have gone through the toll road on a whim or didn’t know which car we were going to take, my wife or myself, depending on who is not driving has paid the toll on our phone. The ones I could never understand were back when there were toll kiosks the people who would queue in line to pay their toll on Boxing Day only to then join a queue on the toll road! +1 First time users, tourist, elderly or the poor without any internet would surely be the only ones without setting up an auto topup account. Same as HOP, nothing more of a waste of time to not take the effort to setup for long term use, even though a bit of cash sits in their accounts. I’ve had other family members added on so they don’t have to bother sometimes. Though once I sold a car and forgot to take it off, giving them about 4 free trips! Regarding tourist they are better advised to go the slow way anyway for the better scenery & interesting drive, which I now kind of missed having used this way mainly…though don’t travel this way much now anyway. I went that way last weekend. It was 35 minutes quicker to take the old road and saved 2 bucks or whatever too. I use that road less than a handful of times a year but have the autopay setup because it saves me hassle, saves me time, and saves me all those penalty fees when i forget to pay. I heard half the fee goes towards collecting the fee. A fuel tax would be so much more efficient. 35min quicker. Must have been blocked like it will be on the coming weekend. The current toll hardly pays the maintenance of the road and tunnel. It was originally tolled to get NZ used to autotolling as it was planned to toll other roads like waterview connection etc. I don’t mind tolls when the cost is low like JHT. Although it would help traffic flow if we tolled yhe alternative routes and not the motorway designed for safety and volume. You would only toll traffic that left then reentered the motorway so locals don’t pay. That’s a far better idea. Tolling was introduced as an option for projects that did not meet the criteria for funding but there was sufficient public interest in paying a toll to bring them forward. You are right Waterview was expected to follow this path but the Key government decided to fund it anyway. That must have been someone’s little joke though, given how little of the cost of any of the roads is met by tolls. Along the lines of “let’s pretend we use the public’s money wisely yet give choice when it’s requested ha ha”. The tolling was never meant to cover the whole cost, just bridge the gap between the time when the NLTF would have funds available for it based on priority and the earlier date it was actually built. That is officially true. I was involved in a project looking at tolling tech pre JHT and it was definitely supposed to be the intro to wider use. I’m hoping the new government will take more note of future energy supplies before funding new roads no matter who pays, resources need to be prioritized to areas that have a long term future. This from HSBC, one of the largest banking and financial services institutions in the world. But isn’t the cost per km of Transmission Gully rocketing up too? Now that NZTA have admitted the consortium building it has had to do massively more amounts of expensive earthworks than was originally planned, costed/budgeted or actually consented? And so whats to stop Transmission Gully ending up rivalling the P2G highway as most expensive per km? So we have in effect two nearby “RoNS” style projects, ostensibly being built and mainly justified on the alleged ability to provide resilience in the event of earthquakes and other natural and man made disasters. And we now have, it seems, both racing “to the top” to be the most expensive pieces of roading. And no amount of tolls, even for 50 years will likely recoup that scale of spending on those roads. Nor by the sound of it, will that scale of spending even guarantee much if any more resilience for the roads network come the “next” big one. And of course, the alternative free roads will get zero safety upgrades in the meantime or once the tolled road opens, meaning people have to choose the “free road” death trap or the pay as you drive it tolled roads. Not much of an alternative really. So it truly raises the question what the hell we’re actually building and (considering) tolling these roads for. Yes, the country doesn’t gain resilience through excessive wasteful spending. The reason why we’re building new motorways is primarily due to the commercial interests of NZ’s transport and construction sector, who are effective at lobbying behind closed doors. NZ’s transport sector is the single largest contributor of political donations. It’s little coincidence that Steven Joyce was National’s campaign manager (responsible for fundraising) and the inventor of RoNS. Me too. Much better idea. The toll toad paying needs to be more forgiving and reminding. I always forget to pay my toll and get fined. It is not a good experience and I end up avoiding toll road because I always get fined. It would be better to send reminders email to me based on my last paid email address. Four days is simply too short and by the time I remembered I already get fined. Ideally it should have a remember visa card and auto pay functionality that link my last paid visa card to my plate number. It does have auto pay functionality. You have to set it up though. the NZTA auttopay system is so advanced that it emails you when an auto topup fails to go though because your credit card expired. And it doesn’t block your account and steal your money like HOP. It’s so amazing that they figured out how not to steal your money. NZTA should have talked to NZTA when they tendered for the HOP system. NZTA had pretty big teething problems with their system initially, though. However, point is – they fixed them. When I lived in the San Francisco Bay Area, I was able to set up an auto-pay against my registration number, and then I could just drive through the Fast-Trak lane at every bridge in the area. They must have had as many toll bridges in the Bay Area as we have toll roads in New Zealand. I can think of six without looking at a map. Could someone set up a national system auto-pay tolls? There is already a national system of auto pay tolls. Though I think ‘national’ includes only the nothern toll road and one around Tauranga at the moment. Depends on whether you include the Rainbow Rd between St Arnaud and Hanmer Springs. The landowner (not road owner) sits at his gate and collects a toll, definitely not on the NZTA system! The landowner is also the road owner in that case aren’t they? Bit of a grey area, they are actually the pastoral leaseholder as it is high country land, although that is pretty similar to private property rights. I think you are technically right that they own that stretch of the road, although it’s maintenance is fully undertaken by Transpower as it is is the access road to the interisland power pylons. It really should be put into the public domain as part of the tenure review process. The road up to the Mt John observatory in Tekapo is a bit like this. The University of Canterbury own the land and road, and have started charging $8 per vehicle to pay for maintaining the road. I suspect there’s probably a few more of these little private toll roads around the place. It’s interesting that NZTA have got this far through the Petone to Granada link road, and only now realised how bloody infeasible it is. While many argue that it is needed as a road, to stop people living in the Hutt having to go South before they go North, there is already a road (Haywards Hill, route 58) that exists and makes more sense. And will save almost a billion dollars. I sure know what I would do if I was the Minister for Transport ! Hint hint Phil ! There is a certain irony that this massive cut through the landscape (very hard rock, massively tall cut required) is proposed to go through the hills right next to the existing Horokiwi quarry (you can see it in the second to last image above). I’ve been searching for the numbers and can’t find them, but it is something like: the volume of the rock taken out of Horokiwi over the last 40 years is a similar volume to that being proposed to be dug out of the new route, in the space of about 2 years. Something like 8 million cubic metres in total. Of course, if someone had actually planned ahead, we could have had the quarry people actually taking rock out of this area and the route would be already dug… but that’s too sensible. Or, that the new route is planned to go through the existing old quarry, so that the digging didn’t need to be done. Instead, there are questions over: what to do with all the rock? The authorities swear that these things are not interconnected, but there are two potential projects nearby: a possible “Great Harbour Way” i.e. cycle path all the way from the Hutt into the city of Wellington, that would take many millions of cubic metres of rock to form…. and also a possible extension to the Airport, which would similarly need many millions of cubic metres of rock fill as well. Coincidence? Personally, I think not. ill be annoyed if the cycleway and airport runway dont go ahead because they dont have the fill. $8 to use the Mt John observatory road at lake Tekapo because the university owns the land…. mm didn’t our tax money pay to build the university. More corruption. I will deliberately drive around all roads requiring a roll or not use it. Try to read the academic research we’ve paid for, too, Shaneo. I’d be keen to get that changed. I have no problem with congestion tolls across a cordon (as long as they are supported by rapid transit ) as they are there for a purpose. I have an major equity issue with “road tolling for revenue” in that why should the people of, say, Wellington pay revenue tolls (NZTA is not suggesting congestion tolls on these links – the authority should consider this) when the people of Christchurch get to use the new northern arterial and southern motorway stage 2 for free. Either new links are tolled nationwide or they are not tolled at all. Also revenue based tolling can have extreme equity effects on specific households and individuals where there is not a reasonable & viable non-tolled alternative. (i.e. a few people end up paying tolls everyday + fuel excise tax while the rest of us just pay the fuel excise tax). 4) Can easily be implemented tomorrow. Let’s tax this. Can’t say the population weren’t warned. National were the ones in power in March. So they are going to undo their own work? National were going to need an additional 10c per litre nationwide fuel tax to fund their Rons 2.0. I imagine they will be staying reasonably quiet on road charges.